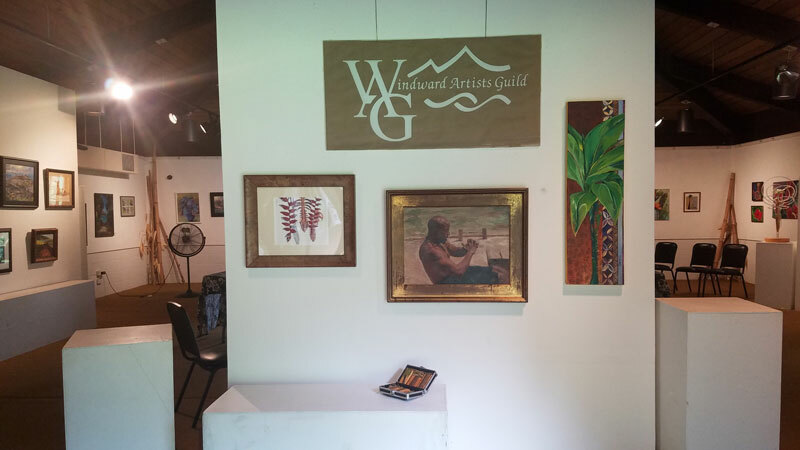 Windward Artists Guild is looking forward to the upcoming Spring Reflections Show at Honolulu Hale, March 28 – April 18, 2019. Please plan to join us at the reception on April 4, 2019 from 4 – 6 pm. Parking is available in the underground municipal garage with entrances on Beretania and Punchbowl Streets. Please note the parking is metered, so bring a few quarters to feed the meter. Artists can download the prospectus here. Please fill out the REGISTRATION FORM below: DEADLINE: November 14th. 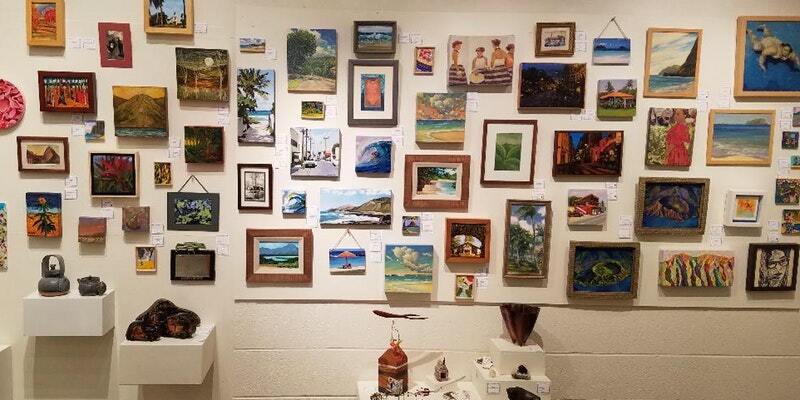 The 59th Annual Member Show is on display at Hoomaluhia Botanical Garden Gallery. The gallery is located at 45-680 Luluku Road by the visitor’s center. Come see the beautiful and meaningful artwork created by our guild throughout October (until the 26th). The gardens are magnificent and are open for free to the public daily from 9 am – 4 pm. There is plenty to explore after you have seen the art show, so plan time for a nice long walk if you can. 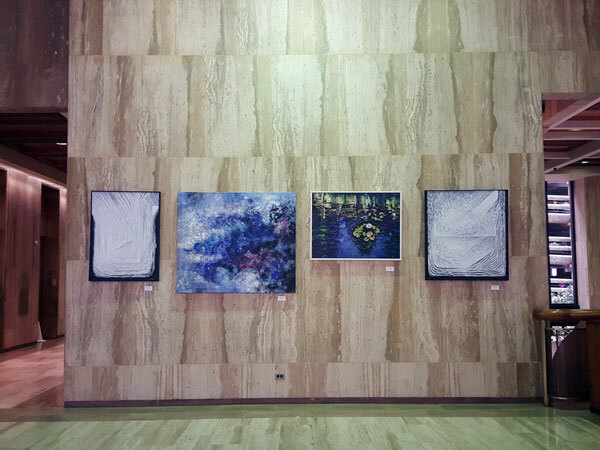 Here are two previews of the show, but of course it is only showing about half the wall space. Prepare to be impressed – it’s a great show! 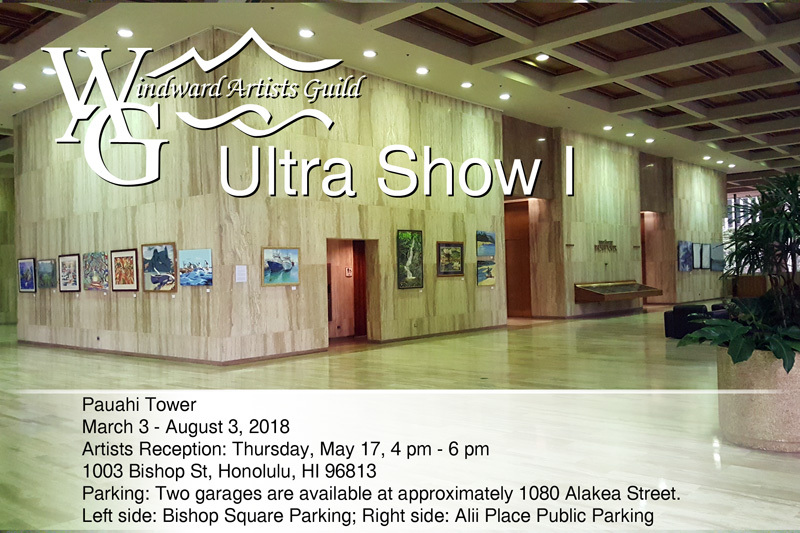 Remember that the Ultra Exhibit is still on display at Pauahi Tower in downtown Honolulu as well – it is rare for us to have two shows at the same time for the guild, but it’s been a great year for exhibit opportunities! 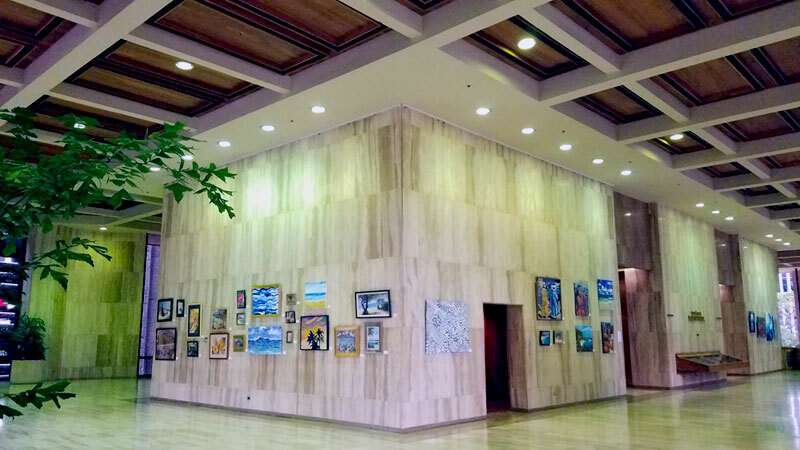 Once again Windward Artists Guild has placed a show at Pauahi Tower’s gorgeous second floor space which is covered in beautiful travertine stone and topped by soaring coffered ceilings. The spacious venue allows WAG artists to show their large works which offer a valuable interior design option for offices and homes and the chance to collect major works from talented local artists. Aloha Artists! 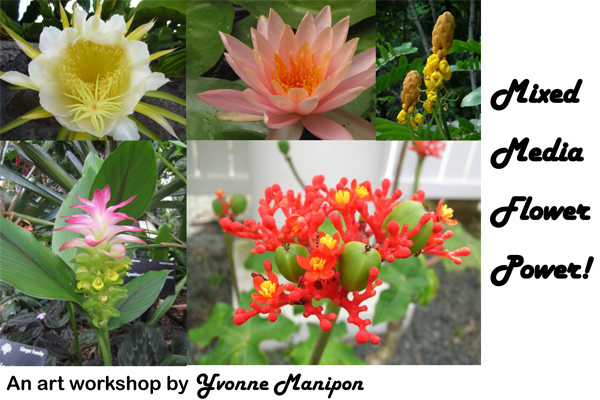 Join us for a wonderful workshop this October. Join Yvonne, an accomplished artist and art educator, in this fun workshop sponsored by Windward Artists Guild (WAG) for artists of all levels. Beginners are especially welcome. 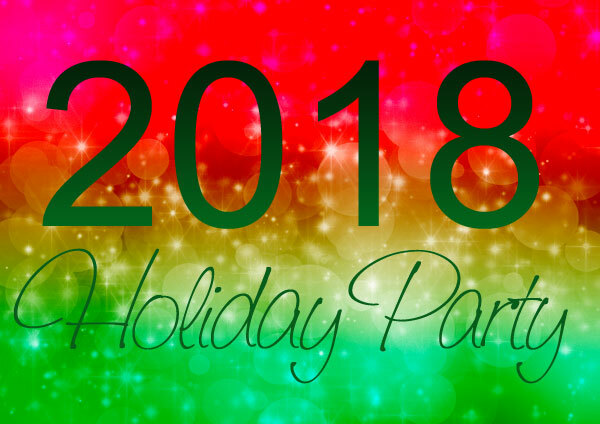 Fee is $10 for WAG members and students*, $15 for all others; all materials will be provided. Payment must be received by October 6**. Send registration form and check (payable to Windward Artists Guild) to: WAG, 88 Pinana Street, Kailua, HI 96734. Get member rate by joining WAG online now! *Students grade 9 and above. **Workshop limited to 20 participants. We reserve right to cancel if insufficient enrollment; fees will be re-funded in full. 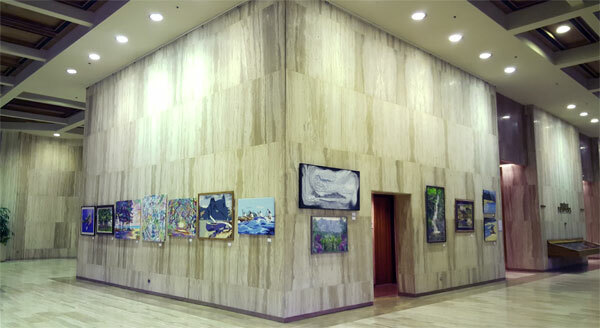 Enjoy WAG’s larger art work at Pauahi Tower’s gorgeous second floor space which is covered in beautiful travertine and topped by soaring coffered ceilings. The spacious venue allows WAG artists to show their large works. 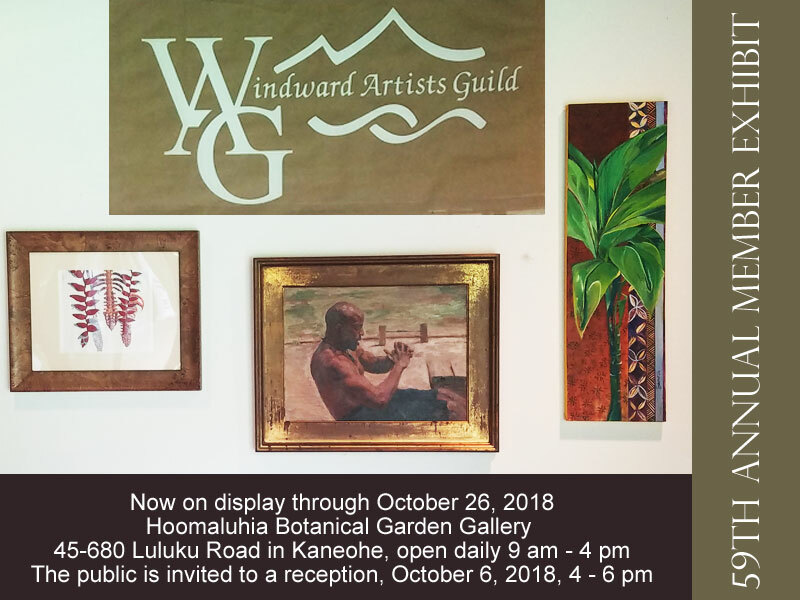 All works are for sale and 15% of those sales are donated to Windward Artists Guild whose mission since 1960 has been to stimulate the visual arts on Oahu. We will use the proceeds to fund our education grants, workshops, and to help sponsor art events that are beneficial to the community. Parking entrance is on the left at approximately 1080 Alakea Street (Bishop Square Parking), or you may park in public parking at Alii Place across the street if you prefer a slightly cheaper option with a small walk. 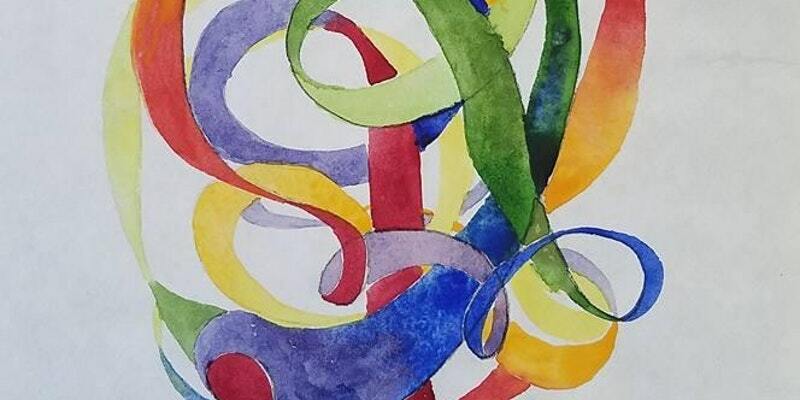 Artists Reception: Thursday, May 17, 4 pm – 6 pm. The public is encouraged to join us at the reception. The show was curated by Katherine Love of Honolulu Museum of Art. Thank you to Katherine for a job well done. Permission to display our work at this lovely location was graciously given by Douglas Emmett Management. Many thanks to the management and security teams who have been so helpful to us. Show Chair Wendy Roberts is the contact for any sales windwardartistsguild (at) gmail.com. She would like to express her appreciation to Cindy Livermore, Cynthia Schubert-Richmond, Don Johnson, Adriana Franc, David Friedman, Thomas Deir, and Nadia Fairlamb who helped hang the artwork. 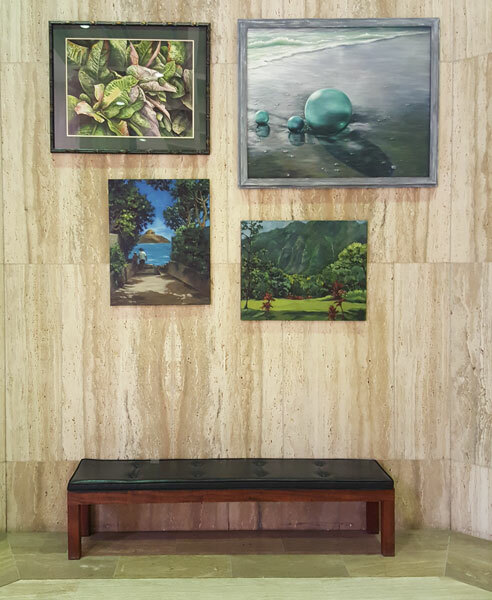 Artwork: “Quiet Exhuberance” by Julie McIntyre, “Beach Treasures” by Jill Butterbaugh, and “Kailua Beach Access #8” and “Ho’omaluhia After the Rain” by Cynthia Schubert are on display in the northwest corner of Pauahi Tower second floor. Artwork: “Monochromatic About It” by Dennis McGeary, “Moonlight Diving” by Nadya Rego, “Night Bloom” (sold) by Sharon Baker, and “”Peace Hope and Clarity” by Dennis McGeary. Our walls change over time. Come see what is there now! One of the beautiful display cases filled with WAG art. 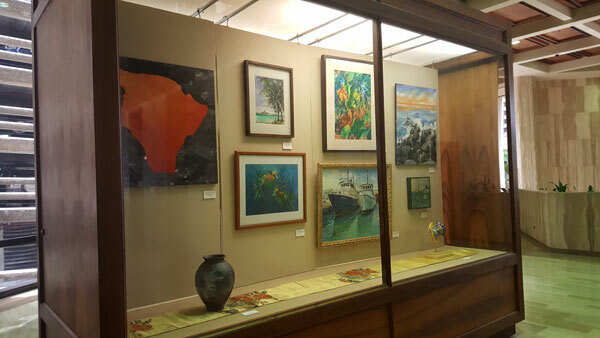 Featured paintings: “Big Island Lava Tube” by Thomas Deir, “Lanikai” by Jenee Wonderlich, “Seadragons” by Barbara Littenberg, “The Eyes Have it” by Davilla Harding, “Honolulu Longliners” by Barbara Sumida, “Magic ISland” by Rance Nakama, “Robert Frost” by Claudia Wallace. 3D work: 3D works: “Sweet” Raku by Barbara Guidage and “Whimsical Fish” Ceramic Sculpture by Jan Stiles. Dawn Yoshimura is teaching her techniques for handling watercolor and keeping it vibrant and clear by painting meditative Color Bridges®. There is a FREE workshop that is important for more than just competitions – it’s all about the finer details of photographing and framing art properly. 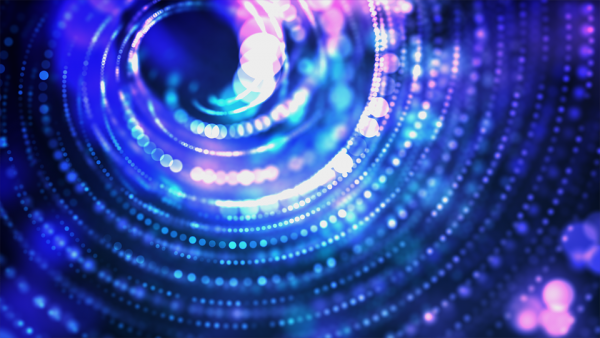 This information will help give your work the polished presentation it deserves. Dawn Yoshimura will be teaching a workshop on how to get your paintings ready for competition from photography to framing. This is in partnership with Association for Hawaii Artists, but it’s open to anyone! Do you know how to photograph your art and submit it at the right size? Do you have beautiful art but the photos don’t do them justice? Have you picked up your work from a venue and notice that someone has had to tighten the wire? Has your work ever fallen off the wall? Has a piece you have framed ever stuck to its protective glass? Do you use cardboard or boxboard to back your pieces even though they contain acid that will ruin your art over time? Do your eyehooks interfere with your piece hanging flush on the wall so the piece tilts? Please come learn how to remedy these common mistakes and much more! We highly recommend you attend this FREE lesson on the best practices to make your art polished and professional. Better to know now what mistakes you are making than to have a problem at the next show! UPDATE: We have additional display space for small pieces. Feel free to enter works under 24″ too… We can pretty much take anything up to 10′ now that the extra small works space is confirmed. If you have already entered and want to add an additional piece and pay via Paypal, you may send the $5/piece to windwardartistsguild@gmail.com from your Paypal account using the “Send money” feature, or mail a check for the additional to the same address in the prospectus.